WAAPA provides Production and Design students with the greatest diversity of ‘on-the-job’ theatrical experiences. Our students have access to simulated industry training in the design, construction and management of the Academy’s annual repertoire of 35 plus productions, utilising our seven diverse performance venues, as well as numerous external performance spaces. 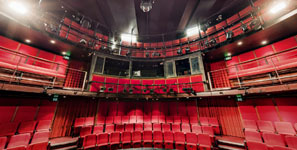 WAAPA’s professionally staffed and equipped workshop and wardrobe facilities, along with state-of-the-art lighting and sound studios, give students immediate ‘hands-on’ access to all production development, construction and staging processes associated with the most up-to-date industry expectation and practice. Incorporating an exciting mix of national and international professional directors, teachers and supervisors, WAAPA’s year-long season of drama, music theatre, dance, opera, films and jazz, classical and contemporary music concerts gives our Production and Design graduates the winning edge in preparation for a seamless transition into a wide range of careers within the creative and technical industries both here and abroad. Download important information about the auditions process. You should also visit the Interviews, auditions and folios web page. For further enquiries please contact Student Recruitment on 134 328, or for calls outside Australia, (61 8) 6304 0000.